For a short but comprehensive description of the instrument, read the Casali et al, or refer to the Hawk-I page. the operation of HAWK-I more than 80% of the time with an equivalent K-band seeing of 0.55" (instead of 0.7" without GRAAL). The expected gain is roughly a factor 1.5 to 2 (in integration time or limiting source flux), depending on the science goal. GRAAL is based on a 4 Na-LGS (sodium Laser Guide-Stars) system, launched from the corners of the centrepiece of a Unit Telescope of the VLT. The lasers are pointed towards areas located outside of the science field of view (7.5 arcmin), and the light re-emitted by the 80-100 km altitude Sodium layer is collected by 4 WFS (wavefront sensors) each with 40x40 subapertures. The slopes provided by the WFS are combined to provide an estimate of the WFE for the lowest layers; this shape is then removed from the actual shape of the DSM. The AO-loop is closed at a 700 to 1000 Hz frequency. As the LGS are not useful to sense tip-tilt, an additional visible Natural guide-star (NGS) WFS is embedded in GRAAL, and the tip-tilt is corrected at a loop frequency of 250 Hz. The science HAWAII 2RG infrared sensors of Hawk-I will as well be used to correct slow drifts between visible wavefront sensing and IR imaging paths, coming from flexures and uncompensated atmospheric dispersion, taking the opportunity of continuous reading of the science detectors during integration. Hawk-I uses the adapter/rotator of the Nasmyth focus to derotate its field of view. On the opposite, GRAAL LGS-WFS must derotate the pupil; therefore GRAAL includes an LGS-ring, a derotator carrying the LGS-WFS, which counteracts the adapter's effect (to which is added the pupil rotation, proportionnal to the elevation of the telescope). GRAAL performance: cumulated seeing with/without GRAAL; the lower values are in K-band (2.2 micron); right, the FWHM performance with/without AO. The open diamonds are with AO; the black line represents the limit set by the Hawk-I instrument sampling (0.1"/pixel). Below 0.8" visible seeing (40% to 50% of the night time), the atmosphere will not be the limit for high resolution K-band images: the instrument can reach the maximum resolution of 0.2". This picture shows HAWK-I attached to the Nasmyth adapter. More pictures can be found in the ESO Press release about Hawk-I first light. 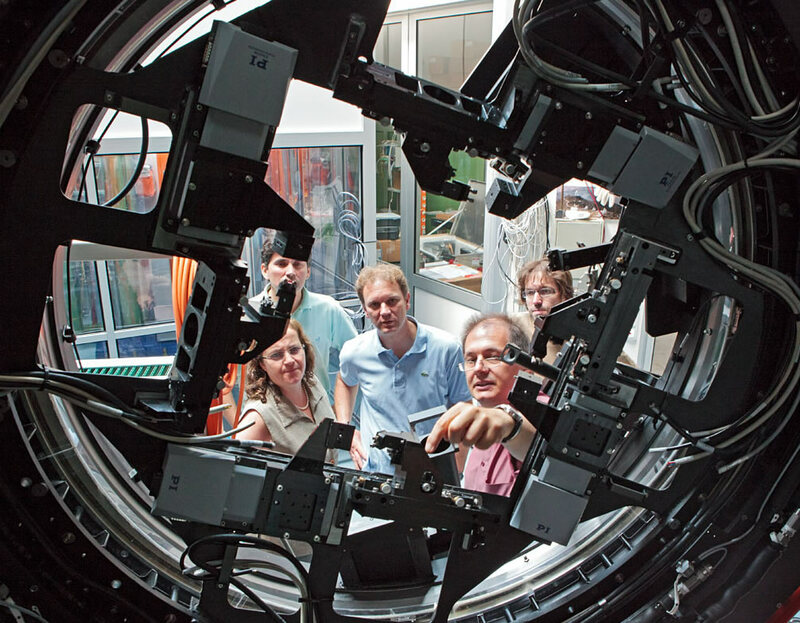 The removal of Hawk-I from its operation location reveals the adaptive optics module, GRAAL. 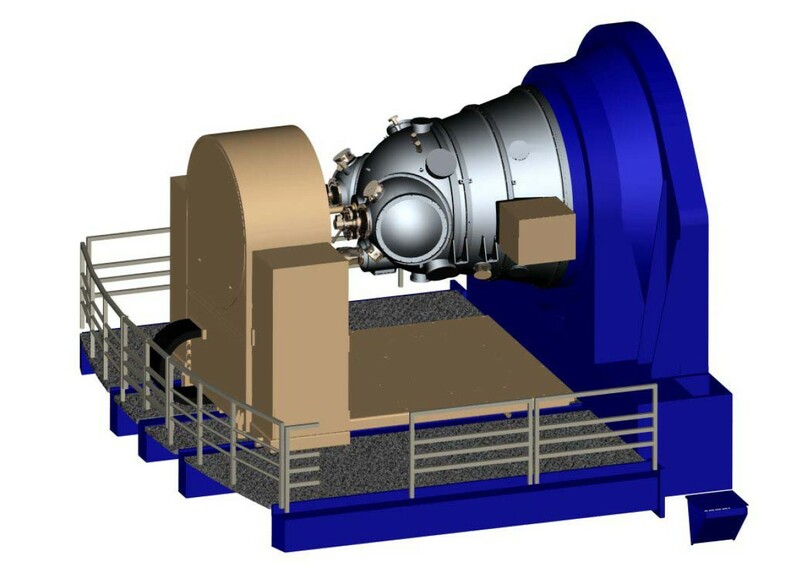 Here, Hawk-I's spherical vessel and equipments have been discarded, and only its sleeve towards the telescope's adapter has been kept. Below: a general view of GRAAL, as seen from the Nasmyth platform, as an early concept and up-to-date. Early concept (2006): the LGS-WFS were moving over a wide range (100 mm) to accomodate the variable Sodium layer distance (from 80 to 180 km). 2008 concept: optical trombones have been introduced to provide a compact solution, with the travel range needed halved, and more compact optics. Lifting of GRAAL during its installation in Garching laboratory. First steps in optical alignment. Defining the telescope optical axis to align the instrument. GRAAL after completion of the main assembly by NTE. The metallic flange is 2 m diameter and will be attached to the telescope flange. Seen from the Hawk-I side. Trombone stages surround the scientific instrument's field of view. They will allow the compensation of the variable distance to the Sodium Laser guide-stars. With the introduction of large thin shell deformable mirror technology, especially for the MMT (in operation) and for the LBT(in development), the possibility of building high throughput (and correspondingly low-emissivity) adaptive infrared instruments takes form. At the same time, the development of the MCAO (multi-conjugated adaptive optics)and of GLAO (ground-layer adaptive optics) allows building instruments having improved seeing or diffraction-limit performances over a wide field of view (see for example the MAD project, providing both AO modes). Both ideas have merged in two instruments, the visible spectrograph MUSE, and the infrared imager HAWK-I. They will both benefit from a near-ground conjugated secondary deformable mirror, providing at the Nasmyth focus a throughput higher than 80% (in K-band). 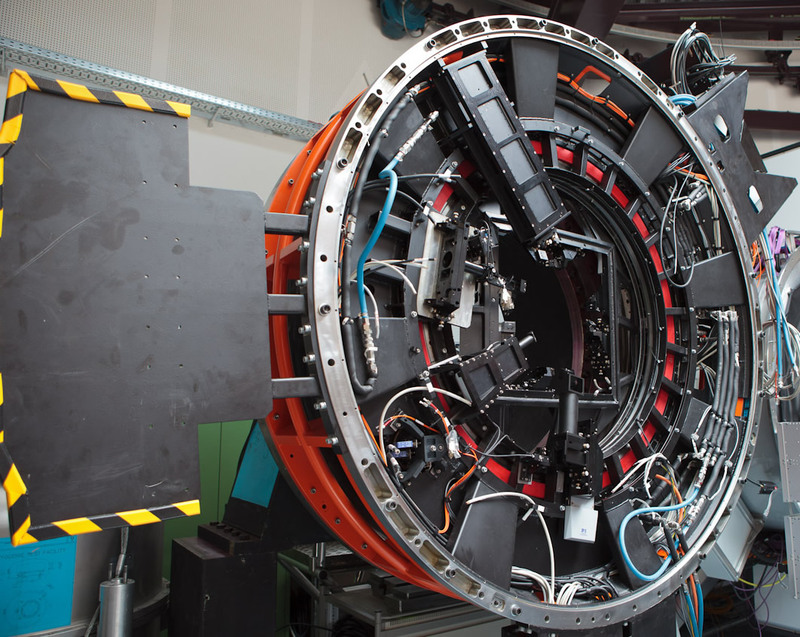 Hawk-I will make use of the whole unvignetted field of view of the VLT, being as well able sampling the best seeings available in Paranal, with a 0.1" seeing.